Another opportunity arose today for me to practice my craft photographing spectacular residences. What a great job I have. I love my life! On the down side I drove Doug to the airport this afternoon as he wends his way to Atlanta for a big tennis tournament. Good luck, Doug. This was one of those perfect summer days, and all I wanted to do was float in the clear warm ocean water watching the colorful fish swimming by. I did manage to swim a while, saw lots and lots of turtles, Bruce's visitor was still in residence but quieter, and these bluefin trevally came up to check me out. They are too big and I feel intimidated when they come by, but they're not nearly as big and scary as the awa we've been seeing the past few weeks. 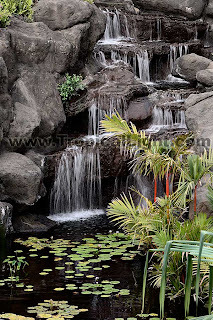 Life does not move quite as fast here on Maui as it did back in the big city. I got an order today for photos from a shoot I did over three years ago! Yes, more than three years later and I may actually get paid! Of course the client needed the photographs today. No problem! It is a good thing that I am so ridiculously organized (some people use other words to describe me). 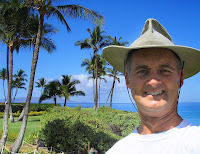 I had another fun swim this morning with my friends the Maui Pink Cap swimmers. 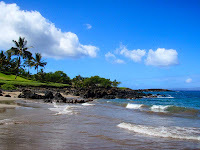 The big swim race weekend is coming up next week, and swimmers are beginning to arrive on Maui. 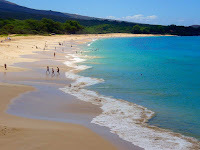 Saturday is the channel swim from the island of Lanai to Maui (click HERE for info) and Monday is the Aumakua swim on Maui (click HERE for info). Also on Monday is the Waikiki Roughwater swim (click HERE for info). Click HERE or above for the Video of today's swim. I've lived on Maui so long now that I often lose sight of how truly magnificent this island paradise is. It takes showing a malahini (newcomer) like my friend, Francesco, the sights to open my own eyes. Today I took him on a hike through the lava fields to a local snorkel spot popularly known as the Aquarium. 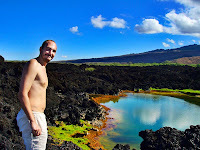 While I was steadfastly fixed on my goal of tropical fish, Francesco stopped at one of the anchialine pools we passed to marvel at the unusual colors. Of course, he was thrilled by the abundance of colorful tropical fish as well. Like yesterday, I often heard the sincere "Fantastic!" from him. Maui truly is no ka oi. Joe's partner, Francesco, came down for a swim this morning. We swam out to a cluster of boats where we came upon a large group of spinner dolphins. 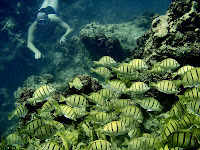 We swam with them for almost two hours and Francesco kept saying "Fantastic!" with a big grin on his face. He said that swimming with dolphins had been a life long dream; it was obvious that he was stoked (click HERE for more photos). Will he really want to return to Amsterdam after an experience like this? I did, of course, get some video too (click HERE or below for the video). My old friend Joe is visiting Maui for a week. When you meet him, he appears to be pretty much your average Joe (except obviously smarter). Yet this man has the drive to accomplish whatever he sets out to do. He decided to swim the English Channel, he swam the English Channel. He decided to climb the tallest mountain on each continent, he climbed the tallest mountain on each continent. He enjoyed playing the piano, so he worked at it until he finally performed in a major concert hall backed by a full symphony orchestra. His example has taught me that if I want to do something, then it is up to me to do it. That simple! Bruce had a roommate today. 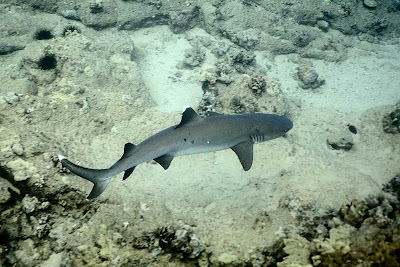 Where Bruce is shy and reserved, this new shark was active and aggressive. It even had the audacity to charge me! The nerve! Fortunately this outgoing behavior was conducive to photography (click HERE for more photos - the top four were from today). Woohoo! The dolphins stopped by for a brief visit today. Although they passed by a few times, they were definitely keeping their distance. Also with me were my friends Lynne and Scott (who still uses a film camera - how quaint). Click HERE for more photos. I got THE questionnaire for jury duty in today's mail, which means that I will be called to serve soon. I am happy to do my duty for my community, but twice in one year? I guess there just aren't enough residents on this island to handle all of the frivolous lawsuits which make America the great country it is. The wind was blowing, the waves were crashing and most of the pink cap swimmers opted for calmer waters, but four of us chose adventure. We made it to (but not up) the cliffs at the south end of La Perouse bay and reveled in the wild water (click HERE for photos from today). This was one of those days when the ocean was clear and warm and I was only interested in floating and watching the little fishies play. It took me an hour and a half to swim what I usually cover in an hour. I spent time observing a large school of akule being followed by a big bad barracuda, and a line of fish waiting to get cleaned by a rainbow wrasse. I also spotted this fish which I had never seen before. Anybody know what it is? Not to worry, Hurricane Flossie has dissipated to an insubstantial mist. While I could see the looming clouds to the south yesterday, here it was sunny and I had a lovely ocean swim. I even encountered an elusive manta ray at the same place we saw spotted eagle rays on Sunday. "What a rack!" I said to myself this morning as an axis deer with a full set of antlers crossed the road only a few yards from where I was walking. I need to work on my draw, though. The buck disappeared into the bushes on the other side of the street before I could get the camera out of my pocket. It is a normal beautiful sunny day here in Makena while we wait for Flossie to decide which way she is going to go. The last time a large hurricane got this close was Iniki in 1992. Iniki missed Maui entirely but washed away all the sand from our beaches. From my experience most hurricanes around here make an abrupt turn to the north at some point, usually before getting to the Big Island. So the question for me is: when is Flossie going to make that turn? 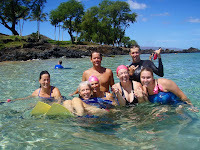 I had another great swim this morning with my friends, the Maui Pink Cap Swimmers. Christine and Joyce freed the reef from a large amount of fishing line with hooks and weights. We saw lots of sea turtles, three spotted eagle rays, and a school of frantic fish (darting here, there and everywhere at high speed). Our newest guy, Brian, swam the farthest he has ever swum; and Josh, Rich, Janet, Patti and Steve did some serious training for the Aumakua Swim coming up on September 3rd. Click HERE or on the image for more photos from today's swim. I just got the most incredible massage. How is it that we find this guy three days before he moves off the island and back to the mainland? It isn't fair! Not that our usual massage therapists aren't amazing, they are. But this guy took it up a notch to the sublime. The house I'm working on today is perfect in nearly every way. 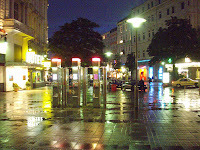 The instant I walked through the gate I felt I was in an oasis retreat - I had stepped off Maui and into another world. All of the wood and stone (and there is lots of wood and stone in this house) was carved in Bali. Not to excess as is so often the case, but subtly and with superb taste. My favorite feature is the dining room which is outdoors in a designated gazebo overlooking the ocean. Magical! Wow! Life is good. I swam for an hour with wild spinner dolphins for the second day in a row! 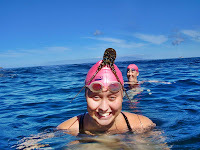 Several other swimmers joined me today among whom were three visiting from Germany (including the woman in the photo). Click HERE or on the image above for more photos from today. Be sure to check out the baby dolphin in the last photo on that page. I did an even better job on today's Video than I did yesterday. Click HERE (or below) to watch the video. Again, keep your eyes open for the baby dolphins. I am already getting stressed out after working from before sunrise till after sunset for the past two days. Lucky me when a group of spinner dolphins came to join me for my swim this morning. The proud parents brought their two infant dolphins over to me so that I could ooh and aah over them; new additions to the group since my last swim with them in June. Click HERE or on the photo to see more photos. Click HERE or above for the video of today's encounter. 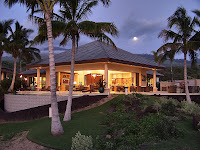 Reality came crashing back on me yesterday as I spent four plus hours commuting (Kapalua and back twice) and most of the remaining hours photographing another spectacular Maui home. But what a great commute and fun job! Each of the amazing residences which I get to experience have at least one feature which sets them apart from the others, and this one had several. The most interesting to me was that the four en-suite bathrooms had sliding doors which pocketed out of sight, making them all outdoor rooms. Of course, if you want privacy the glass doors are frosted up to head level. 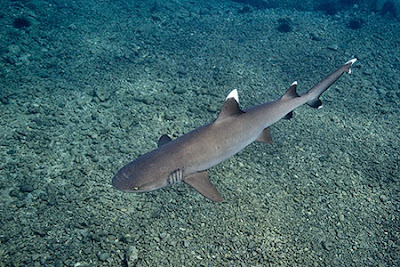 It was great once again getting back into the warm Maui ocean waters with my friends this morning. We swam, we explored, we swam, we played and we swam some more. Not only are we a fun group, we are FAMOUS. Check out the most recent issue of Maui No Ka Oi magazine for a feature article about us (click HERE for the story). I am still feeling out of shape so I did not lug the big camera into the ocean this morning. All the photos were taken with my little point and shoot camera. Which means there was video today! Click HERE to see the video. Our friend, Bruce, was out and about this morning, swimming here, there, and everywhere. Among lots and lots of sea turtles this morning, turtle number four swam by a couple of times. It looks like its transmitter has lost its antenna, but turtle number four looked healthy and doing well. This was one of those mornings when the water was magnificently clear. 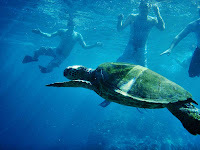 What a joy to be swimming on Maui. On a walk this morning I saw a much needed first - a real city-type mass transit bus. Public transportation on Maui? The end must be near. Then I was comforted by a more familiar sight: someone getting fully into the right lane without a turn signal to make a left turn. It was 52 degrees and raining (again) yesterday in Hamburg and 82 degrees and sunny this morning on Maui. I think Maui is where I belong. The 24 hour flight was uneventful. I watched two movies (Spiderman 3 wasn't as bad as I had heard) and read the new Harry Potter book. I have been a big fan of the books, they are great summer reads. It was great getting back into the warm ocean waters this morning. 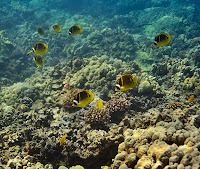 No unusual critters today, just beautiful tropical fish and large sea turtles.